The sunniest county in the United Kingdom, West Sussex is a great place to soak up some rays and relax whilst touring the county as it rolls towards the coast. West Sussex’s only city, Chichester, is nestled at the foot of the South Downs on the banks of the River Lavant and dates from Roman times. A great place to spend some time, Chichester offers sandy beaches, lively harbours and a cosmopolitan atmosphere with museums, galleries and an exciting collection of shops and restaurants. Chichester Cathedral has stood in the centre of the city for over 900 years and you can take in a range of arts spanning medieval to modern times. Coastal towns include Shoreham-by-sea, Worthing and Bognor Regis. The seaside resort of Worthing is just 90 mins from London by train. Strolling the promenade will give you the opportunity to sample the sea air, take in the pier and view the artworks. With a history as a fishing and smuggling village, Bognor Regis was developed into a seaside resort and grew rapidly with the evolution of the railways. You will find a sandy beach and lots going on, ranging from live music, traditional seaside entertainment including amusements, rides, relaxing gardens and a range of restaurants and cafes. Bognor Regis is also home to the annual Birdman of Bognor contest where competitors launch themselves from the Bognor pier in an attempt to glide the furthest, usually not very far. 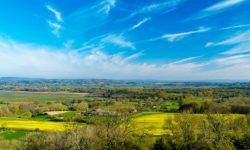 Britain’s newest national park and one of “Britain’s Breathing Spaces” the South Downs National Park is a varied countryside of grassy rolling downs, ancient woodland, river valleys and coast line. The Park is great for walking, hiking, cycling and horse riding amongst recreational activities. The South Downs Way stretches from Chichester to the coast in neighbouring East Sussex and you can take in the Bronze Age barrows at Old Winchester Hill and Devil’s Dyke, the subject of one of Constable’s great paintings. West Sussex is home to a number of castles including Bramber Castle, Amberley Castle and the spectacular Arundel Castle overlooking the historic town of Arundel nestling below. The almost fairy tale castle was originally created in Norman times and added to during the 19th century. Arundel Castle has been home of the Duke of Norfolk for the last 600 years, the grounds also include the Fitzalan chapel – it is well worth a visit. West Sussex has a number of stately homes to enjoy, choose from Goodwood, Petworth House, Nymans House, Stansted Park and House and Uppark. And you can enjoy a number of gardens including Bignor Park, High Beeches, Borde Hill, Parham House Gardens and Wakehurst, home to the largest growing Christmas tree in England. West Sussex’s famous names include Anita Roddick, founder of the Body Shop and Tim Peake, the British astronaut. West Sussex has a large range of annual events, including the Sussex Beer Festival, the Festival of Chichester, the South of England Show and the Goodwood Festival. Sussex Day takes place on 16th June, St. Richard’s Day, to celebrate the county’s heritage and culture – St. Richard of Chichester is the patron saint of Sussex.